MUMBAI: Star News’ Bengali sibling, Star Ananda, seems to have got off to a good start. At least in Kolkata. 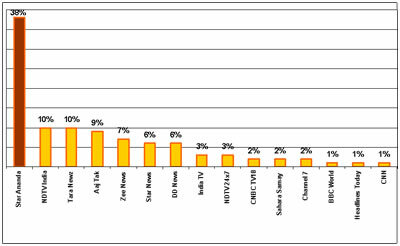 In the first week, figures show that it managed to corner a market share of 38 per cent amongst news channels. Officially born on 1 June, Star Ananda’s nearest rivals in the first week in the Kolkata market have been Tara Newz and, surprisingly, Hindi news channel NDTV India, both of which have a 10 per cent market share each, as per TAM data. Aaj Tak, Zee News and Star News with market share of nine per cent, seven per cent and six per cent, respectively, follow the top three. Surprisingly, for a city that should have been more at ease with English than Hindi, apart from the local Bengali language, English news channels’ market share is negligible. According to the TAM data, in the first week of Star Ananda’s launch, channels like NDTV 24x7 and Headlines Today have a market share of three and one per cent each. International news channels like BBC World and CNN too sit low in the pecking order with one per cent market share each in Kolkata. Uday Shankar, CEO of Media Content and Communications Services India Pvt Ltd (MCCS), which manages Star Ananda, attributes the performance to the “presentation of news on the channel,” which focuses on having a balance between local and national, international and other types of news. On the day the Bengali news channel made its debut, TAM figures show, it had notched up a market share of 45 per cent, followed by Tara Newz and Aaj Tak, which had shares of 10 and eight per cent, respectively. Contacted by Indiantele vision.com, Tara Newz, promoted by former Star India CEO Rathikant Basu, did not hand out any comment on Star Ananda’a performance. However, Kolkata based industry observers pointed out that the high market share of Star Ananda could have been the curiosity of viewers to check out a new product. It needs to be seen whether Star Ananda could sustain this market share over a longer period of time, a media expert observed. According to TAM data, national language news programming in Hindi or English has 36 per cent viewership in the largely Bengali speaking West Bengal market. Regional language news parogramming in Bengali garners as much as 46 per cent viewership. MCCS is a 74:26 joint venture between ABP group and the Rupert Murdoch-controlled Star Group. The company has plans to make forays into other languages too offering basically news and current affairs based programming.